Leonard Baskin, Man of Peace, 1952. Woodcut, 59 1/2 x 30 5/8 in. Collection of William Bronston. © The Estate of Leonard Baskin; Courtesy Galerie St. Etienne, New York. Leonard Baskin, Icarus, 1968. Woodcut printed in black and green, image: 32 1/8 x 21 3/4 in. Collection of William Bronston. © The Estate of Leonard Baskin; Courtesy Galerie St. Etienne, New York. In the case of Icarus, the distorted torso and limbs are seen from below, surrounded by rugged wings that will soon stretch in ill-fated flight. The use of the green-inked color block allows the artist to create gouged, white highlights that further accent the misshapen body. Baskin’s experiments with technique are often most evident when he chooses to explore himself. Over the course of his career, he returned many times to expressive self-portraiture, creating a series of prints that document his progression through life and as an artist. A monoprint from the 1980s is such an example, its outlines etched into a copper plate and printed, before an additional layer of pigment was smoothed onto a second plate and printed on top of the first image. The artist then added highlights and a few other lines with the brush. Baskin crops out almost all background, and even part of his head, focusing in on his aging face, which stares out at us with piercing green eyes. The unnatural reds and yellows intensify the effect of deep thought and perhaps sorrow in a man whose development ran counter to the prevailing culture, and counter to the art world as well. 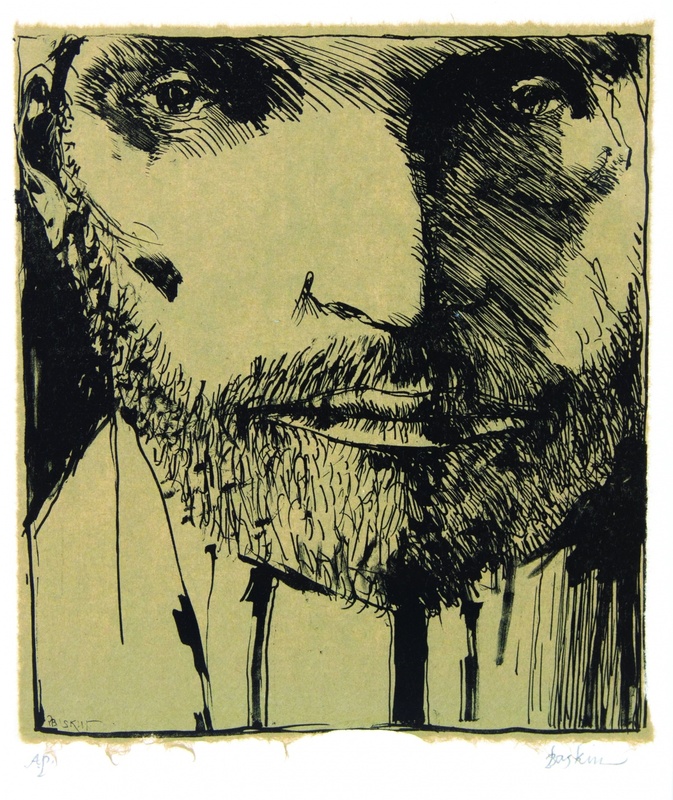 Leonard Baskin, Self-Portrait, n.d. Color monotype, touched, with yellow, green, red, blue watercolor and white opaque watercolor, plate: 5 x 3 15/16 in. Collection of William Bronston. © The Estate of Leonard Baskin; Courtesy Galerie St. Etienne, New York. Baskin sometimes deals with grim subjects directly, as in his Sated Death. A feathery figure, either winged or wrapped in a plumed cloak, looms over the viewer, his small, skull-like head contrasting with an enormous belly. Far from the hooded skeleton of allegory, this Death inhabits a fat body, one that has feasted on humanity. Such commentary on the human predicament runs throughout Baskin’s work, as he focuses on the faults and injustices of life. By his own admission, Baskin aims to evoke alarm and misgivings in the viewer, yet he also aims for exaltation. Underlying his work is the firm conviction that his art will prompt us to correct our behavior and ultimately lead to a better world. Leonard Baskin, Sated Death, 1992. Etching, 23 1/8 x 17 3/4 in. Collection of William Bronston. © The Estate of Leonard Baskin; Courtesy Galerie St. Etienne, New York. A Passionate Muse: The Art of Leonard Baskin is on view at the Crocker Art Museum from February 17 - May 12, 2019. Sponsored in part by U.S. Bank. Cover image: Leonard Baskin, Self-Portrait. n.d. Woodcut on greenish brown wove paper, collé to cream wove paper, image 10 3/4 x 9 1/4 inches. Collection of William Bronston.